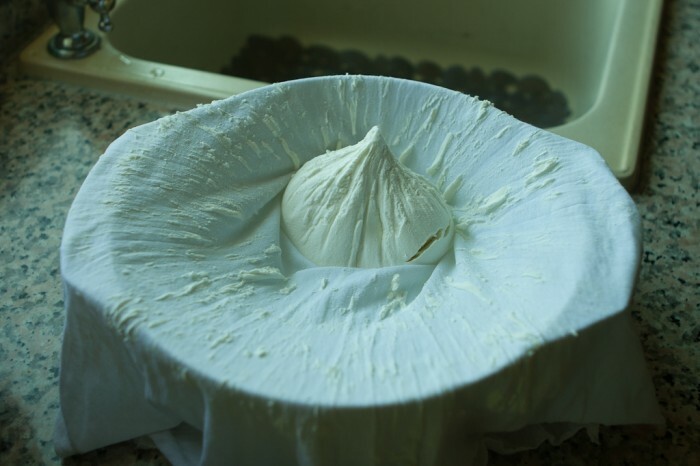 Labaneh (or Labneh) is a thick and creamy spread made from fresh yogurt milk which has been strained in order to remove the whey using cotton cloth. 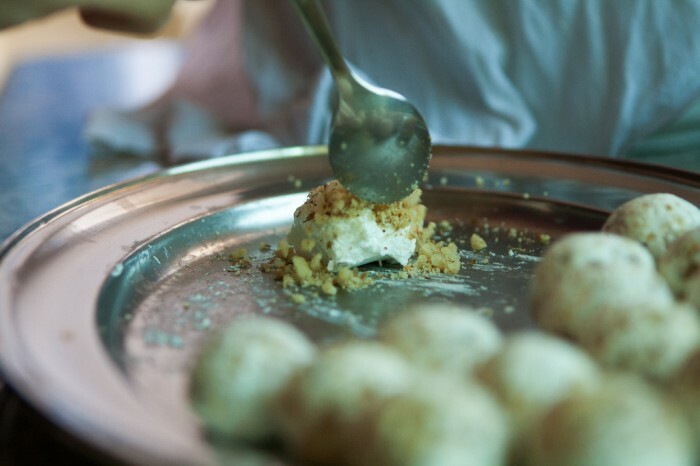 Labaneh balls in particular are made from a thicker form of labaneh that are rolled into small balls and kept in olive oil filled jar. Thicker form of labaneh necessarily means more straining time, more produced whey, and more food longevity. 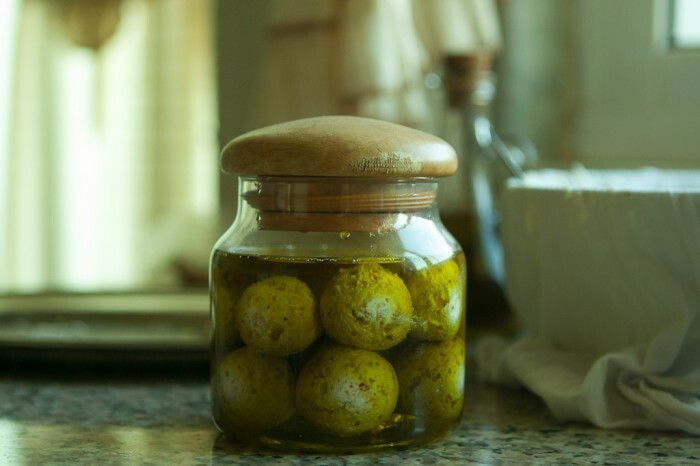 The jar of labaneh balls is an important element of Levantine cuisine and no Palestinian kitchen is complete without it. It is a sort of preserved food usually made from cows’ milk couple of times a year and it can be used and consumed for many months. 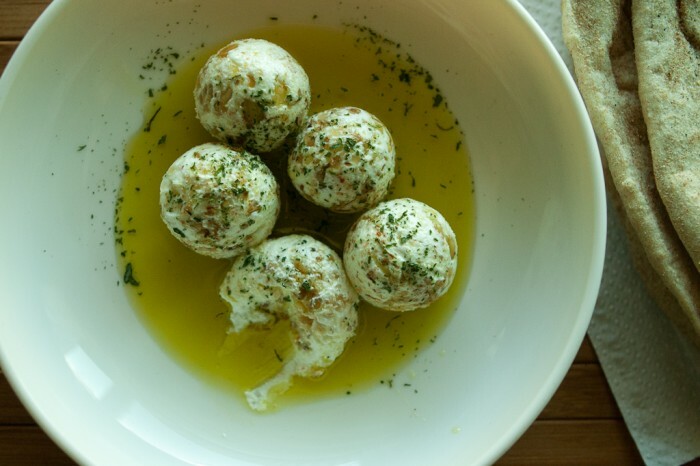 Labaneh balls are commonly served for breakfast and dinner with taboun or pita bread, olive oil and pinch of crush dried mint. 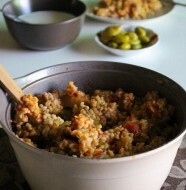 In this recipe, I’ll be mixing labaneh with walnuts, hot red pepper, and garlic for rich flavor and high nutritional value. Add salt to the fresh yogurt and stir. Then put the salted yogurt in any clean cotton cloth you have like cotton undershirt. Press them by closing the cotton cloth tightly. 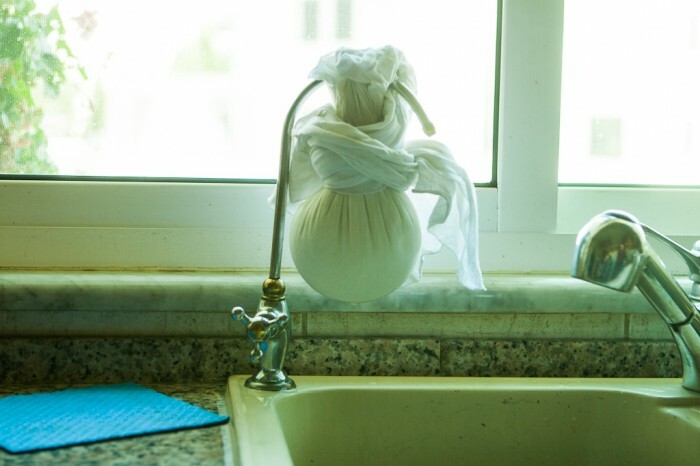 Hang the cotton bag over an empty bowl or the sink. Leave it to drain for about 20 hours. 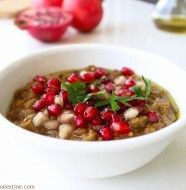 *less time is needed (about 6 to 8 hours) to make creamy spread labaneh. Meanwhile, mix crushed walnuts, hot red peppers, and minced garlic together and put aside until labaneh is ready. Open the bag of fully strained yogurt. Take about 1 full teaspoon of strained yogurt, add to them a half teaspoon of walnut mix and start rolling into a small ball. Repeat this step until you get a full jar of labaneh balls. *Put some olive oil in your palms when you start the rolling process to get smooth shaped labaneh balls. Fill the jar with olive oil until you completely cover the labaneh balls. Seal the jar and keep it in room temperature. When serving, garnish with a pinch of dried mint leaves. Add some olive oil from the jar to the serving plate. 13 Comments on "Strained Yogurt Balls (Kurat Labaneh)"
Inspired by this post… we made “Labaneh” at home :) Very yummy ! 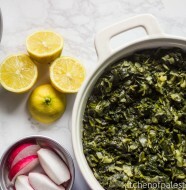 hi, post the recipe of the labneh with watercress. Sounds interesting! never had it before.. dried or fresh watercress? Can you make this without the walnuts? Will they still hold together? – I’m on a no nut diet but these look so good. 20 to 24 hrs of straining yogurt will produce a thick-enough form of labaneh, that will be easily rolled up and kept for long time. yum yum.. please add up some more recipes..
Hi. Should they remain at room temperature the entire time or should they ever be stored in the refrigerator? Also, how long do they keep for? Yes, you can keep them at room temperature all the time and consume them within 5 months. Make sure to totally cover them with olive oil. what kind of salt, fine or kosher-style?